Dear guests of the Palace of Sports! 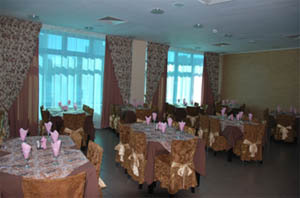 Wellcome to our comfortable cafe in Palace of Sports. We are ready to hold banquets, celebrations and any corporate events and weddings for you. 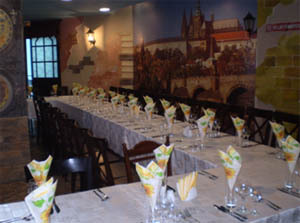 On the ground floor of the main building (Block “A”) is situated a cafe ” Prague “, which has already managed to catch the fancy of the townspeople. Cafe ” Prague ” (40 seats) has to stay quiet, unhurried conversation in an unique atmosphere of Prague, which is created by interior designers. Cafe ” DIVS ” (50 seats). Wellcome to the area of comfort in a downtown. You can always enjoy delicious, the view which affects the aesthetic imagination and is a true example of the culinary arts in our cafe.